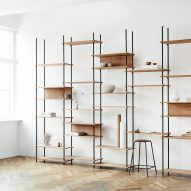 Copenhagen studio Moebe has designed a storage system that can be assembled without tools and uses wooden wedges to hold its shelves in place. 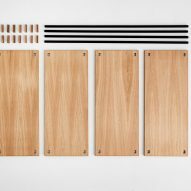 Moebe, which said it takes an "intelligent and simple" approach to design, designed the flexible system to fit any setting. The designers wanted it to be built without the need for screws and tools. 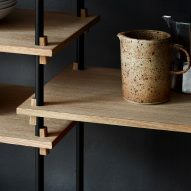 Shelves are held together by a set of wedges, which slot up into precisely angled holes in the timber slabs. 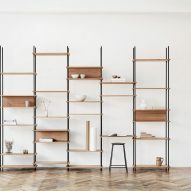 Rounded steel uprights hold the shelves in place, allowing them to be placed at any height. As the wedge is pushed in from below, any additional weight on the surface only makes the joint tighter and more stable. 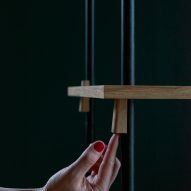 The uprights come in three heights and can be linked together to be extended in both width and height. 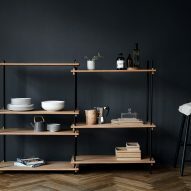 "Using wedges as the key principle gives the users the full freedom to play around with the system, placing the shelves at any given position and fitting it to their specific needs," said the Danish design studio. 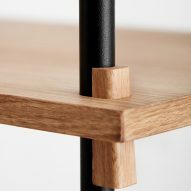 "The clever construction and fine lines give this piece of furniture its refined look." 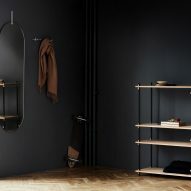 The shelving system, which comes in oiled oak and black stained ash wood is the brand's largest piece of furniture to date and is set to launch alongside a new coat rack and full-body wall mirror. 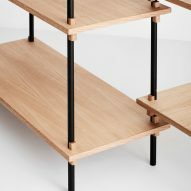 Founded in 2014, Moebe is run by partners Martin De Neergaard Christensen, Nicholas Oldroyd and Anders Thams. 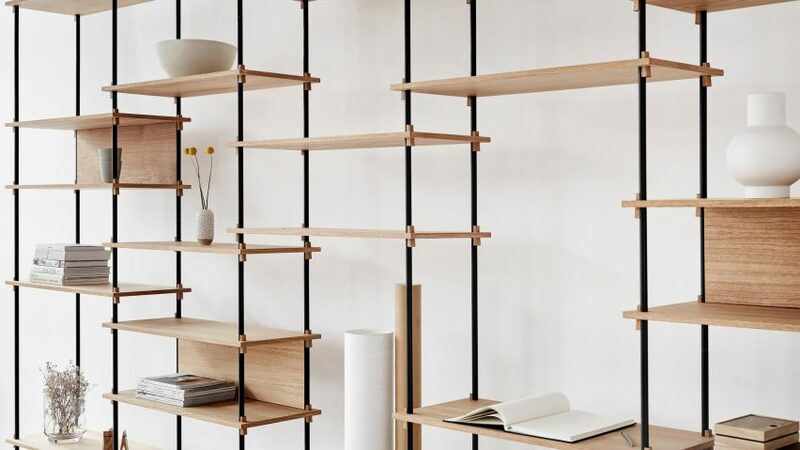 The studio creates products for both their own brand and others, as well as interior design for private clients and companies. 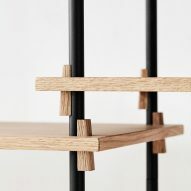 "We design based on the principle of creating simple constructions; not glueing, welding, using screws, etc," said Thams. 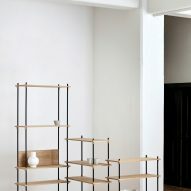 "Instead we try to challenge these common ways of constructing products. We strive to reduce our designs to their most simple forms and functions and thereby create design leaning towards the banal." 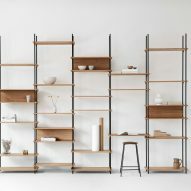 The shelving system launched at this year's Stockholm Furniture Fair, which took place as part of the city-wide festival in February.